2016 Democratic presidential hopeful Vermont Sen. Bernie Sanders has the support of plenty of Democrats and young people interested in his socialist perspectives. But there's one community whose vote Sanders has struggled to rally in the 2016 election season so far: African-Americans. Sanders was infamously interrupted by Black Lives Matter activists at a Seattle event in August, and the event was shut down. In September, Sanders met with a group of Black Lives Matter activists, though many still believe Sanders hasn't done enough to address racial inequality in America. But during Rachel Maddow's Democratic forum in South Carolina on Friday evening, Sanders explained his plans to win the African-American vote. Maddow noted in her conversation with Sanders that his state of Vermont is 95 percent white. In response, Sanders cited his history of civil rights activism, saying that he attended the March on Washington, during which Martin Luther King, Jr. gave his "I Have a Dream" speech, in 1963. Sanders used Maddow's question as an opportunity to segue into talking about his plans for job creation in the United States, stating that 51 percent of African-American young people aged 17 to 20, many of whom are high school graduates, are unemployed. 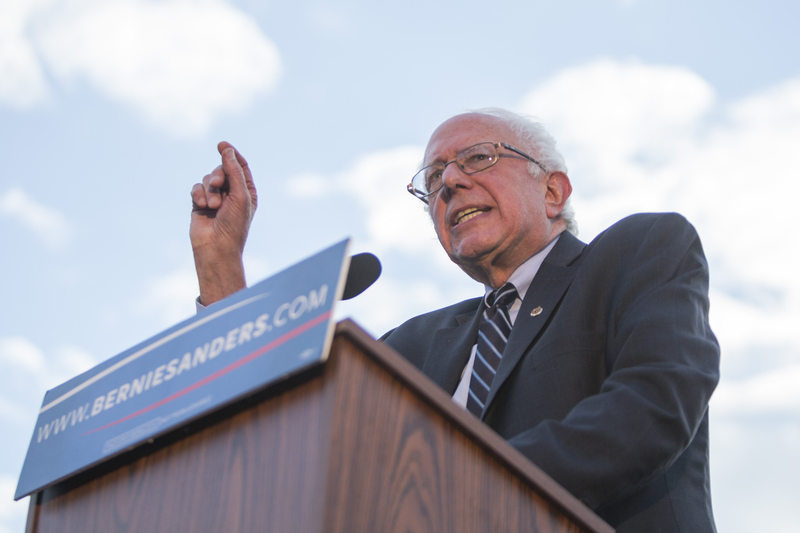 Sanders also mentioned his plan to raise the federal minimum wage to $15 an hour if he is elected president. "I think I have the economic and social justice agenda now that, once we get the word out, will resonate with the African-American community," Sanders told Maddow on Friday. The forum, and Sanders' statements, come as his presidential campaign has released a series of radio ads targeting black and Hispanic voters in South Carolina and Nevada. A CNN poll ahead of the MSNBC Democratic forum found that former secretary of state and 2016 Democratic presidential hopeful Hillary Clinton had the support of 80 percent of South Carolina's black voters. After the August event that the Black Lives Matters activists took over, Sanders issued a statement expressing his dedication to fighting racial injustice. "I am disappointed that two people disrupted a rally attended by thousands at which I was invited to speak about fighting to protect Social Security and Medicare," Sanders said at the time. "I was especially disappointed because on criminal justice reform and the need to fight racism, there is no other candidate for president who will fight harder than me." But when activists met with Sanders in September, they expressed concern that "his role as an elected official in an overwhelmingly white state may make him out of touch with the concerns of black voters," noted The Huffington Post's Dana Liebelson and Ryan J. Reilly. Sanders has also used his passion about U.S. prison reform as a talking point about his plans to end racial inequality. "At a time when the United States has more people in jail, disproportionately black and brown, than any other country, when an alarming number of unarmed African-Americans die in police custody... clearly we have a very serious problem," Sanders said in a September statement to The Huffington Post. It's an uphill battle for Sanders to win over African-American voters, but his statements to Rachel Maddow on Friday prove he won't stop trying. If his speech at the Democratic forum is any indication, Sanders is going to keep strengthening his efforts to win over black voters this election season.